North of New York City is the beautiful Lake George, NY, the perfect escape from the hustle and bustle of the “city that never sleeps.” Just a four hour scenic drive along I-87 N and your summer adventure begins in the famous Adirondack mountains. And with all of the amenities and access to popular Lake George destinations, the Lake George Escape Campground provides the perfect homebase for making your summer getaway easy-as-pie. 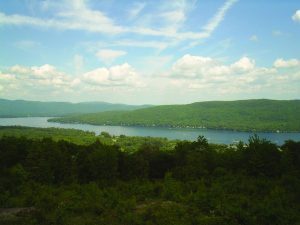 Let us give you a taste of where to go and what to do this upcoming season in Lake George, NY. 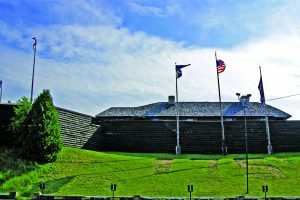 At the Fort William Henry Museum, history buffs of all ages can walk around the historic property of the Kids can have the chance to practice old military drills with a guide; there are live firing demos of muskets and cannons, and on Thursday evenings in the summertime, there is a fireworks display from the Fort! Visitors may also take self guided or guided tours through the museum. The Fort William Henry Museum also hosts a series of historical events such as live reenactments and live music. The year’s biggest reenactment will be the portrayal of the surrender and siege of Fort William Henry during the French and Indian War, and will take place on the Lake George, Battlefield Park, Wood Park, and Fort William Henry, the weekend of August 25, 2017. You can register to become a reenactor and participation is free, just visit the website for more info (fwhmuseum.com). Scottish pipe and drum band, Kings Highlanders Pipe Band, will perform at the Fort on Friday June 16, 2017 from noon – 4pm. The Sutler Shoppe is also worth a visit while you’re there – it’s the largest gift shop in Lake George and is well known for its historical memorabilia. The Sutler Shop is open from May 5 – October 29, 2017. The Ghost Tours are also a popular attraction here. Beware! The ghost tours can get a bit spooky. The “Family-Friendly” tours tell all the ghost stories and for those who really like a good scare, the “Adults Only” tours focuses on investigations of the paranormal and methods used at this extrasensory location. Ghost tours run in the summer and fall seasons and be sure to check the website for more information. The Fort William Henry Museum is about a 7 mile drive along US9 S from the Lake George Escape Camping Resort. Have you ever wanted to be in the mountains in the morning and end your day with a sunset on the beach? Give yourself a day to experience the best of the outdoors that Lake George has to offer! Head out from Lake George Escape Campground on US 9 to reach the trailhead at Prospect Mountain, famous for its 100-mile view of the Adirondacks at the peak. Don’t forget that camera! There are three scenery vantage points along the Veteran’s Memorial Highway that visitors can drive up to the peak for a small fee. If you’re a moderately experienced hiker and are up for a challenge, hiking to the top is a worthwhile experience. This hike goes along the old Cog Railway that used to take visitors to the hotel at the top of Prospect Mountain. Hikers should use discretion when choosing to do this hike – there are several steep drops and therefore, this hike may not be suitable for children. Prospect Mountain is a favorite place among locals and visitors to picnic, hike, or just take in the epic scenery of the Adirondacks at the peak of the Prospect. 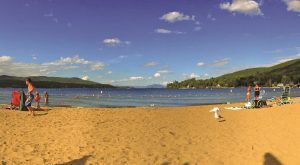 On your way out from Prospect Mountain, get on I-87 N from Beach Rd and NY-9L to get to Million Dollar Beach, one of Lake George’s most popular and largest beaches. This stunning 1700-foot beach is popular for suntanning, swimming, stunning scenery surrounded by the forests of the Adirondack mountains. There is also a public boat launch and is also the site of the annual Americade motorcycle rally every June. Lake George Escape Camping Resort is 178 acres of all of the beauty of the Adirondack mountains. It’s a great place to call home as you visit the surrounding Lake George area! The campground’s 178 acres features so much to do –from two swimming pools, tennis courts, playgrounds, and lounging on the lakeside beach, there really is no shortage of fun and relaxing activities to enjoy at the Lake George Escape Campground. Plus, almost every weekend during the season, there are themed activities. Here are some theme weekend highlights to look forward to at the Lake George Escape Campground! The weekend of May 5 is “Cabin Fever Weekend” where the folks at Lake George Escape Campground are welcoming back seasonal guests! Join the potluck on Saturday May 6 and share your best campground recipe while mingling with your neighbors. 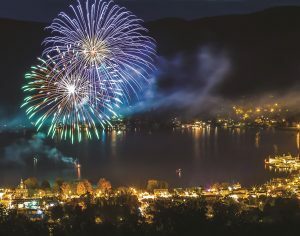 Every family member can get into the act on Memorial Day Weekend at Lake George Escape with a full weekend of parades for pets, golf carts, and the red white and blue bicycle rally. The rumble of motorcycles will be heard the weekend of June 1 as we welcome our annual friends of the Americade! Enter the Best of the Bikes Competition and participate in our Lake George Village Scavenger Hunt to win gift certificates to our Lodge Store! At LGE, we’ll celebrate all of our guests and staff member’s birthdays with one giant birthday blowout the weekend of June 23! Enter your name on our huge campground calendar and we’ll see how many of us share the same birthdays. There will be games for all ages and then we’ll party under the Big Top Tent! Cake decorating, candy, pinata, and party games all for one massive celebration of all of our guests and staff members. Book your reservations at Lake George Escape Campground today. We can’t wait to see you out n’ about!